9:00AM At 9:00 in the morning: Take your baby and your whole family to the nature and have fun! The first stop is at the lake yanxi, often during the spring and autumn every year flocks of geese to the lake habitat, so named. Mountains on three sides by mountains and faces the north ring animation, mountain ranges, the west is a majestic red screw mountain peaks, in one thousand, the monastery of the morning bell and evening drum reminders and lake yanxi natural beauty from afar bring out the best in each other. Gold light mountain and for such as two shinning pearl inlaid in the east of lake yanxi, the top of the mountain there was an old temple - golden light temple, huairou, with the shining under the mountain temple known as the old one of the eight sights - golden light shines. It is said that this was in 2014, the APEC (APEC) meeting, worth to see. 12:00AM At noon, after coming down from the Great Wall, you’ll come to the Burger King at the commercial street, which is always children’s favorite. You can try the most classic choice - whopper Burger King, mouthwatering, with nicely grilled aroma, filled with fresh vegetables and good quality meat. 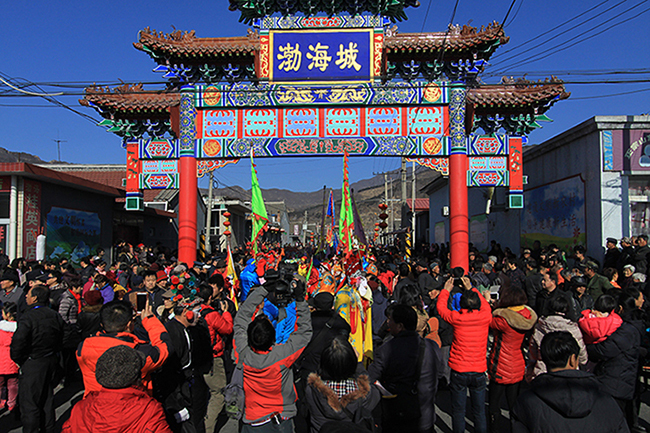 After lunch, have a look at the nearby Bohai Village, where the traditional Temple Fair is being held at Chinese New Year. There are many fresh and lively local shows and traditional activities. Enjoy yourselves in the moment! It’s hard to come by in urban life, so especially your children will definitely fancy seeing such a scene, and run to join them. 2:00PM With the baby finally came to the mutian valley Great Wall in the afternoon，because you want to see the magnificent scenery at the Great Wall covered with snow rather than crowds of people lining up like a dragon on the mountain. This is also a good place for babies to learn and gain experiences. You can buy the ticket to the the Mutianyu Great Wall and the cable car tickets in advance on line, and then you can go through the entrance just by scanning the QR code. That’s it! Take a cable car to No. 14 watchtower, and immediately you’ll feel the breeze. Seen from afar, the Great Wall and the mountains are so charming and awesome! Maybe while you’re admiring the beauty of the Great Wall, your children are already playing snowball games or making snowman with other kids. There seem to be no national boundaries, and only common joy. Having your baby on your shoulders, while holding your beloved one’s hands, let someone take a phone of this great moment of joy and happiness. It’s also a great opportunity to tell your children about Chinese history and traditional culture. In the end, why not try something thrilling to come down on the slide with your family? 9:00PM Around 9:00 in the evening: You can stay at the the Mutianyu Great Wall Boutique Hotel. There are many kinds of rooms, to meet the various groups of people’s preferences. Loft rooms are perfect for families, for children can take the upper floor, and adults can stay on the lower floor. The room is decorated like a cottage in the woods and the lights are like stars in the night. As for dinner, you can order hamburgers and steak to the room for a candlelight dinner, and have a chat with your beloved ones. 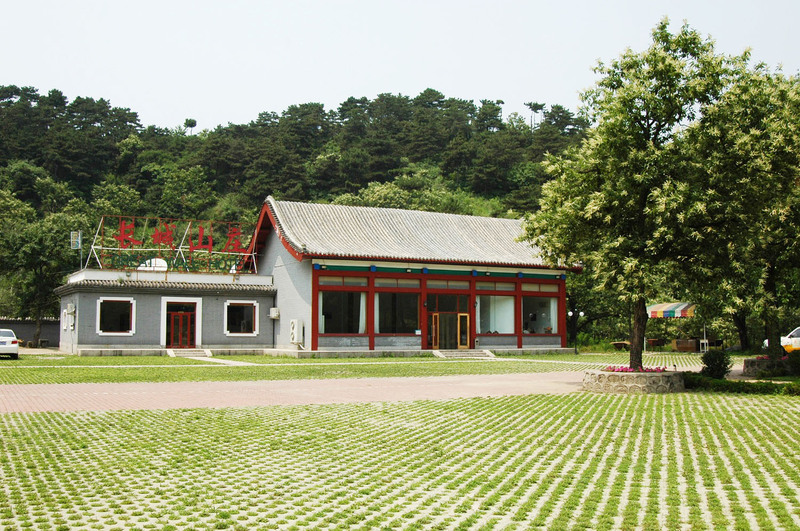 Tomorrow 9:00AM At 9:00 o’clock in the afternoon, you can drive to the Mutianyu organic garden, known as "Back Yard of Beijing”, located in Tai Ping Zhuang village, Huairou District, which is about one hour’s drive from the the Mutianyu Great Wall. In Here, you not only can experience the fun of picking vegetables and enjoy the leisure in the field, but also can get a comprehensive understanding of the production environment and process of organic produce. All the vegetables here are organic without pollution. Besides, you can experience the farming with children, which help improve promote the family bond. Combined with a professional photography enthusiasts and ordinary tourists, the characteristics of the two groups of people, after field visits recommended this photography line. Mutianyu Great Wall as a starting point, early in the morning can shoot the Great Wall sunrise in the whole process, the morning can shoot "cattle horns" and other Great Wall scenery, the afternoon can go to the Great Wall at the foot of the international cultural village folk art, you can also choose the evening sunset shot the Great Wall, Climb the Great Wall, enjoy the Great Wall scenery, understanding of the Great Wall of international culture, is the essence of this line where. The Great Wall is a symbol of Chinese culture, while the Great Wall at the foot of the small village of foreigners to open foreign customs, while maintaining the traditional style of local houses at the same time, the introduction of Western fireplaces, chandeliers, oil paintings and other decorative elements. This fusion of Eastern and Western aesthetic things, are very able to attract photography enthusiasts. 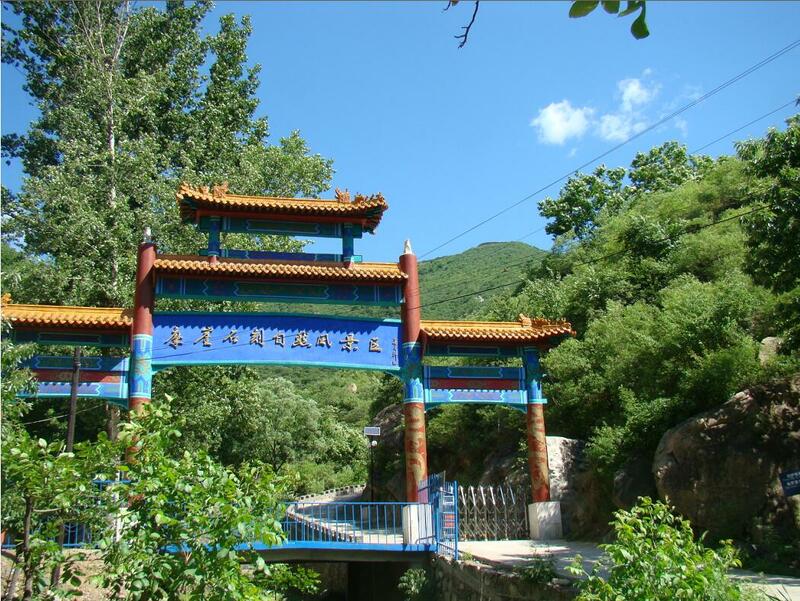 The next shot is "the mountains of ancient villages, the world has not been known," the town of Bohai. Historical documents, the Tang Dynasty, due to the Jiedushi rebellion, Beijing North region into a war, from the Youzhou from the workers were removed to the Bohai Sea area settled, and here as an ideal place to avoid the war. For the generation to remember their own country and tribes, they called their own residence for the "Bohai Sea".Simple farmer, simple and natural and quiet to avoid the small village, whenever you see the curl of smoke rising, see farmhouse, terraced rice paddies,It is a seclusion to avoid the world, self-sufficiency, yellow hair from the enjoyment of the "paradise." 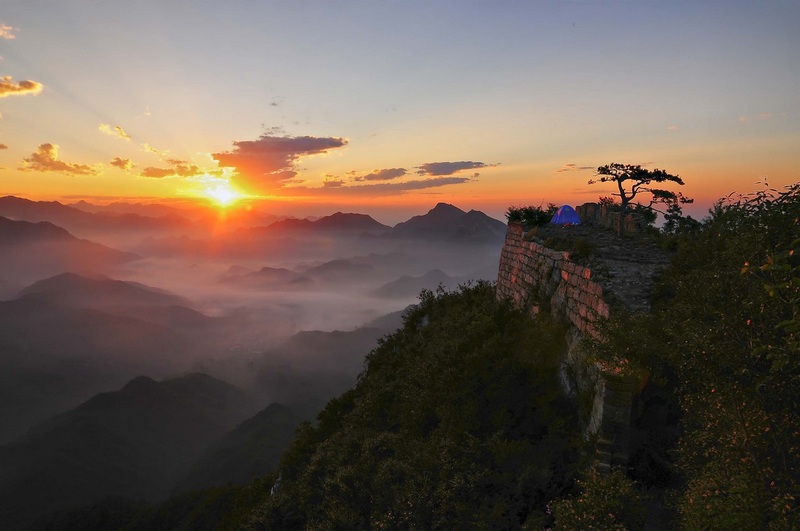 Cliff stone scenic area is a collection of historical antique, cliff stone, landscape ecological hotel services as one of the natural scenic area. Scenic spots within the Ming Dynasty military fortress and the ancient Great Wall site, according to legend at the beginning of the Ming Dynasty, due to investigation is wrong, a section of the Great Wall repair here, and thus become Beijing famous "wrong big city", commonly known as "drooping edge". The valley is divided into nine Ming Dynasty cliff stone, outdoor sports enthusiasts camping, rock climbing, through the great land. In the past to explore is the water lake scenic area, on the way passing a very style of bed and breakfast - ring water 008. 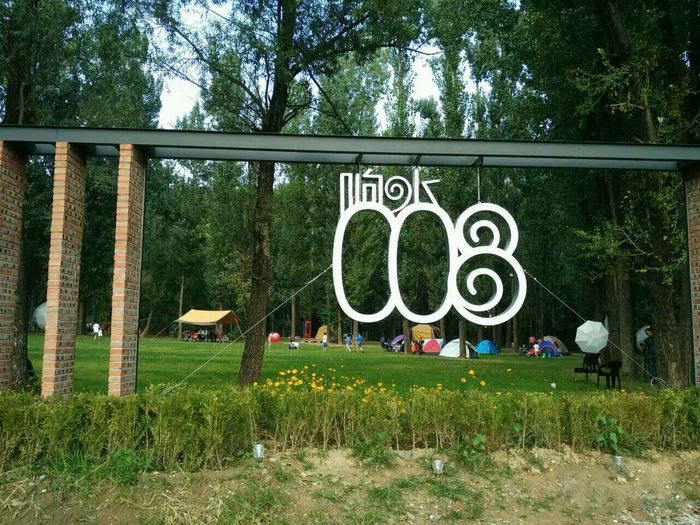 Xiangshui 008 is a weekend to build environmentally friendly outdoor camping places. The children's fun holy places, the gospel of the food, the stars of the night and the lights in the campground echoes the campfire, fried chicken, and the popcorn fries. Lavender's fragrance will walk around you. With the lens record this moment is beautiful. 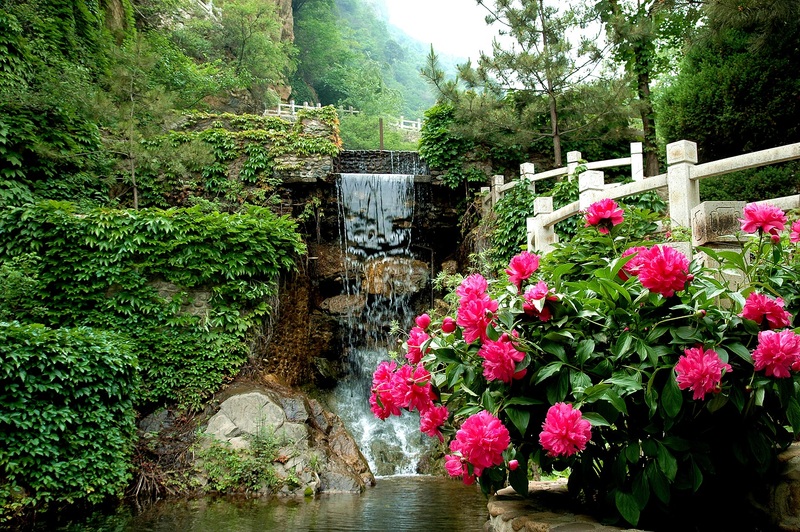 Arrived at the last stop Xiangshui Lake, is set the Great Wall, ancient cave, mountains, springs, waterfalls in one of the natural show valley. 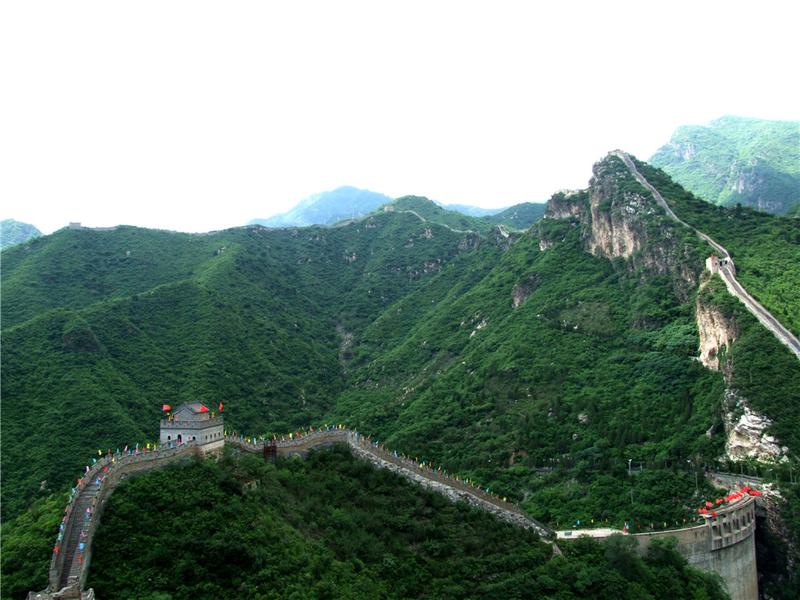 The area is extremely steep, without repair, after the vicissitudes of life and the ancient scenery of the Great Wall, such as the dragon to fly, straight into the sky, Xiongcheng dangerous, very spectacular; health Valley, the source Valley Valley narrow, Looked at the tower towering, steep mountains, near to see the spring gurgling, looking at flowers and trees, beautiful. Sunrise and sunset always attract photographers to press the shutter without a second thought. In the crystal blue sky, the sun rises in the clouds, shines rays of beams to the ground, mysterious, quiet and beautiful. Every photographer can’t help being moved by the beautiful scene and starts to shoot the Great Wall covered in the morning mist. 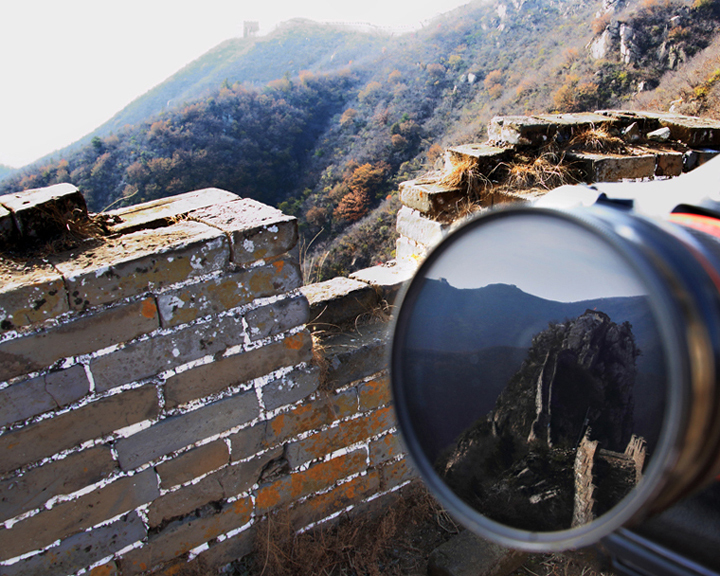 There are fewer tourists in Mutianyu Great Wall, but the view is more beautiful, so you definitely want to bring your old friends - all kinds of equipment, including SLR cameras, lenses, large capacity memory card, sufficient battery power, and tripods. 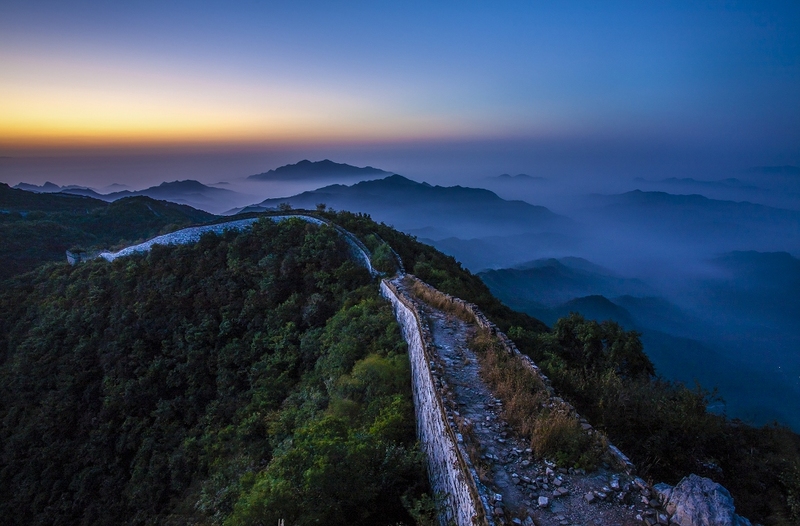 We arrived at the Great Wall at 7:30 am as planned, and the sun has risen above the horizon. Many photography enthusiasts are gazing at the horizon, the sky suddenly is filled with fog and mist, as if everything is gone. The mist is like a silk cloth or rather like snow, covering ranges of mountains around. After a short while, rays of warm light shone through the mist onto the earth, and all of a sudden, I hear clicks of cameras here and there. They seem to be integrated into the changing nature perfectly. I didn’t see the sunny sunrise, but it was still amazing to enjoy the magnificent mist and fog in the Mutianyu Great Wall, such an extraordinary experience of the mighty nature. While coming down the Great Wall, the moisture damped my face gently and I could feel the water drops on my eyelashes, so tender and cool. As they ran down, it felt as if they ran into the bottom of my heart. At 9:00 the sun is bright and the temperature has gone up too. Ready to go to the Great Wall village at the foot of the Great Wall，the heights of pseudo-classic style buildings. Combined with the ancient Great Wall. Here surrounded by mountains all around, fresh air, pleasant scenery. You can Stand in the courtyard can overlook the grand Great Wall. Heights with can host 200 people dining at the same time the large restaurant, dinner can feel the considerate service and delicious dishes. Restaurant food is given priority to with loo sichuan flavor, and taste at the farm house and game dishes, dining way either. At noon: after meal, it’s time to go to Xiangshui lake, which located in a unique geographical area with beautiful natural landscape. When spring is coming, flowers bloom all over the mountains and plains. Walking in the scenic area with your camera equipment, you can take photos of the tower or lofty mountains. There’s also a waterfall about 50 meters. It’s so refreshing standing in front of the waterfall hearing the sound and feeling the water drops falling onto your body. At 2 o’clock in the afternoon, you can drive to the Crescent Bay. Located at Beijing huairou nine cross a river, about a kilometre town, adjacent to huanghua city great water wall.Seen from the top of the mountain, the lake looks like the crescent moon, and that’s how the lake got its name. This area is also famous for flowers, is called Huairou a sea of flowers. In the distance, the mountains are covered with thick green trees and bushes, underneath which is gurgling water. 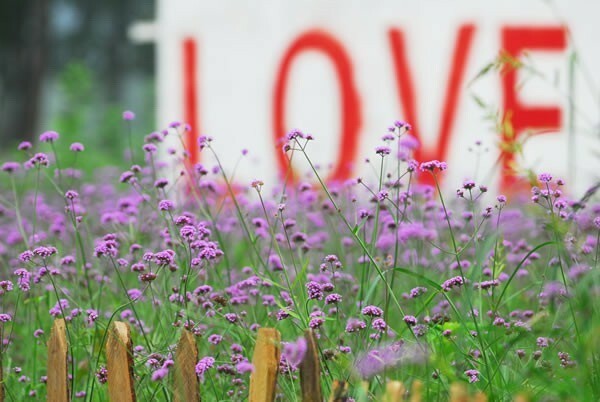 There are many kelsang flowers and patches of romantic purple lavender and sunflowers. Take out your SLR camera and trip to this piece of fairy tale world. Here is the idyllic scenery. You can go boating and fishing on both lakes. There are hammocks, swings, pets and other recreational activities, so you can enjoy outdoor life with your friends. In a word, you can take pictures in the lavender garden, camp in the field, have barbecue in the field, or lie in a lake-side hammock for rest. How wonderful it is to camp with your family and children! You can make barbecue while your children play swing under the weeping willow. When you feel tired, you can rest in the hammock or go swing fishing. A lot of people bring their own hammocks, so that they can quietly lie in a hammock enjoying the time passing.